In the first ‘Clash of the Irons’ boxing matchup four months ago, Jamaica’s Miguel “Iron Dog” Ray lasted merely three rounds, suffering a TKO by Julan “Iron Fist” Brown. On Saturday night, both fighters will face off again at the Multipurpose Sports Complex in another 10 rounds encounter that Ray promises will have a different outcome. In addition to the Jamaican, the 10 bouts card, will feature boxers from Antigua and Barbuda and the U.S. Virgin Islands, taking on their BVI counterparts. Ray said he’s looking for a greater fan support as the bout is on a weekend as opposed to midweek. Among the local fighters on the card, Andrew Lettsome Jr., will be be debuting against Antigua and Barbuda’s Yakita Aska in the Light Heavyweight Division. 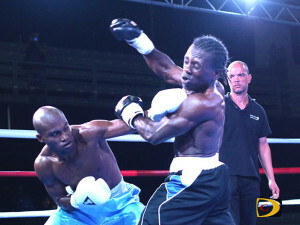 Aska, who narrowly missed the Rio Olympic Games to represent his country, won by a technical knockout over the BVI’s Shemari Chinnery. Chinnery will fight in the middle weight division this time. Kevin Chinnery and Kamari Bowers are scheduled to face USVI opponents while Romario Morgan will come up against an Antigua and Barbuda fighter. General admission is $30, students $15 and VIP $50. Action is scheduled to get underway at 8:30 p.m. Doors at the Multipurpose Sports Complex opens from 6 p.m. for ticket sales. A car will be raffled for $1, with the drawing later that night. There will be other prizes being given away during the event as well as musical entertainment is planned.